Everything Is Safe And Under Control, Isn't It? Müller Dairy in Market Drayton, Shropshire, has been in production since 1992. When it comes to producing quality dairy products to the highest standards Müller is a market leader. Müller's most popular product in the UK is the well known "Müller Corner" which is available in several different varieties, such as Fruit, Crunch and Bio Yogurt Corner. Over 900 million units of these premium quality products are made each year. In addition to these, they also produce other favourites such as flavoured rice desserts and single yogurt pots. Müller manufactures to the very highest quality control and safety standards, they demand the same market leading technology from their equipment suppliers. 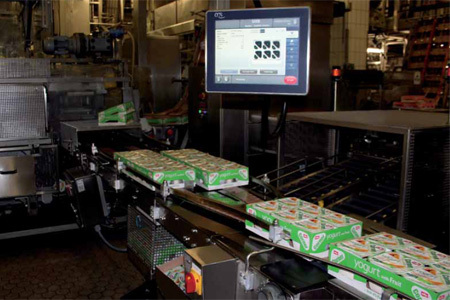 This case study examines how the company implemented precision weighing inspection equipment, equipped with a new camera technology, to maintain and exceed its level of quality.